In January 2015, President Barack Obama enacted the Precision Medicine Initiative, which aimed “to enable a new era of medicine through research, technology, and policies that empower patients, researchers, and providers to work together toward development of individualized care” . With an intensified focus on treating individual patients and not their disease processes, comes the fundamental need for accurate clinical data that can be widely distributed to healthcare providers in an efficient, secure manner. Although the mandatory use of EHRs was established via the U.S. Centers for Medicare and Medicaid Services (CMS) Meaningful Use criteria in 2009 , the broad array of economically competing EHRs used in different hospital systems significantly limits interoperability, and prevents fluid exchange of health information between institutions. As a result, a patient’s individual medical record can be significantly fragmented across the health system, with important documents such as medical history, medication list, and advance directives potentially unavailable in emergency situations. In the modern era of information technology, an increasing amount of data is being transmitted and stored on cloud-based networks. As defined by the U.S. National Institute of Standards and Technology (NIST) , cloud computing is “a model for enabling ubiquitous, convenient, on-demand network access to a shared pool of configurable computing resources.” Cloud computing has proven ideal for such Internet services as information sharing, file backup, and big data analytics, where cost-effectiveness and optimal resource utilization are essential. Thus, given the vast quantities of medical information generated daily, there has been a recent push towards cloud-based storage and distribution of heath care data. However, a centralized, shared data repository presents the risk of cybersecurity breach and directly challenges a patient’s individual right to privacy. Herein lies the complexity of designing a functional health information system that still maintains the core principles of a medical record, mainly comprehensiveness, accessibility, interoperability, confidentiality, accountability, and flexibility . In 2014, the U.S. Office of the National Coordinator for Health Information Technology (ONC) presented its 10-year vision to achieve a universal Health IT infrastructure , stating that “this goal will only be possible with a strong, flexible health IT ecosystem that can appropriately support transparency and decision-making, reduce redundancy, inform payment reform, and help to transform care into a model that enhances access and truly addresses health beyond the confines of the health care system.” The foundation of a new healthcare information technology system must be rooted in platform interoperability, such that data storage and access are standardized, patient safety and confidentiality is prioritized, and a dedication to patient-centric care is maintained. Recently, there has been intense focus on the development of blockchain-based technologies around the world. At its most elemental level, a “blockchain” is a decentralized, distributed leger of digital transactions that allows a trustless exchange of money or data. In existing payment models, such as credit card, money order, or electronic (ex. PayPal) transactions, a third-party intermediary exists to facilitate exchange. Within a traditional transaction, the presence of a centralized institution, with inherent financial incentives, introduces the possibility of bias, dishonesty, and, ultimately, fraud. Furthermore, even with current financial technologies, the inefficient processes of transactional verification can take days before money is withdrawn from one account and deposited in another. Considering these drawbacks to contemporary financial instruments, blockchain technology has developed over time to address the fundamental problems of transactional trust, speed, and integrity. Initially described in 2009 by the anonymous individual or group known as Satoshi Nakamoto, the Bitcoin blockchain was developed as a peer-to-peer electronic cash system . The blockchain functions by sequentially adding encrypted blocks of transactions to a chain, and simultaneously distributing the updated chain to specified nodes across a network. Thus, since the updated blockchain is reliably distributed, the transactions within the individual blocks are immutable, and the integrity of the blockchain can be verified. Public identification keys are used between individuals in a transaction, and the payer cryptographically signs transactions using a hidden private key, known only to the payer. Miners within a blockchain are nodes that construct blocks of transactions to be added to the chain, and are incentivized to work by collecting transaction fees. Thus, it is through the miners that a consensus blockchain is built and distributed to the rest of the network. Since the origin of Bitcoin, other competing cryptocurrencies have emerged, each with a unique distributed leger of transactions, but based on a variable blockchain code structure. Some blockchain technologies, such as Ethereum, allow space in blocks to include “smart contracts,” or lines of code that define self-executing and/or self-enforcing clauses, running only if certain conditions are met. Most platforms have user-owned tokens that can be used to pay transaction costs, encode smart contracts, or transfer data between individuals on the blockchain. As these technologies have developed significant value in recent years, new platforms can use an “Initial Coin Offering (ICO)” to obtain early funding. These coins can be publicly traded on cryptocurrency exchanges, an enigmatic financial sector which had a market capitalization of over $800 billion in January 2018 . Since peaking in value in January 2018, however, cryptocurrency exchanges have lost approximately 80% of their value, reflecting overvaluation in the face of slow adoption by various economic industries . Regardless, the fundamental principle of a blockchain, mainly the anonymous, distributed ledger of transactions, remains relevant and still lends itself to certain technologic applications, such as distributed cloud storage, encrypted digital identification, and decentralized payment strategies. Here, the parallels between blockchain technology and the core needs of the modern health care infrastructure are apparent [4, 6, 13]. In the following section, we review several potential solutions that blockchain technologies address in the current health IT landscape. A summary of the benefits and drawbacks of the use of blockchain in healthcare can be visualized in Table 1. Fundamental benefits and drawbacks of blockchain technology over contemporary financial systems. Currently, there exists a significant challenge distributing medical records across health care platforms, for example, between a nursing home and an acute care center or even between two independent hospitals (Figure 1). This leads to inefficiencies in health data collection and failures to communicate essential health information such as medications and allergies. However, by using novel technologies, a health system can assimilate an individual’s medical record into a block, which can then be cryptographically stored in nodes across a distributed blockchain, accessed remotely by permitted providers, and updated with new relevant medical information. This would obviate the need for patients to bring paper or electronic records to a new health care environment; they would simply allow the provider to access to their medical data on the blockchain. 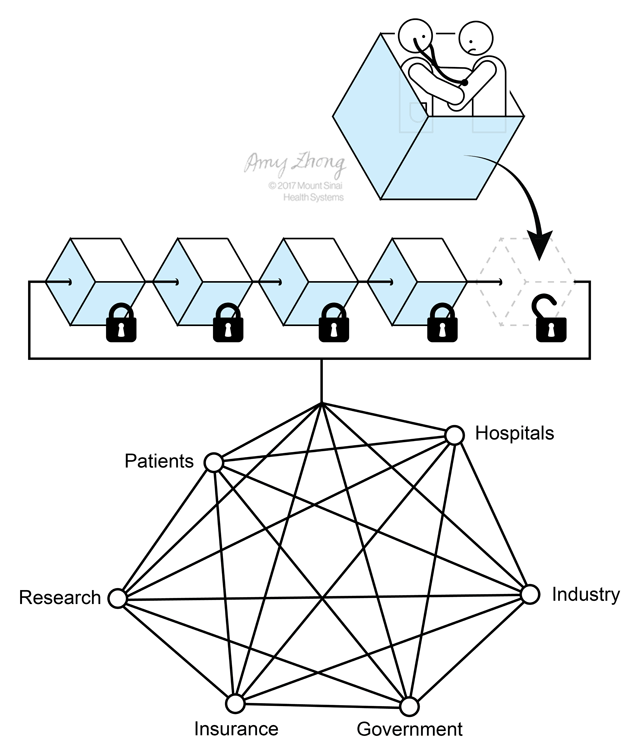 Theoretical schematic of blockchain technology in healthcare. During a healthcare interaction, medical data is recorded via an institutional EMR platform, and the resulting encrypted meta-data is incorporated into an individual “block”. This block is then presented to network participants for inclusion into the blockchain. When a block is incorporated into the blockchain, the entire chain is immediately distributed to all participants in the network, so that each has an identical copy of all data. The resulting blockchain is decentralized (no central authority has ownership), immutable (changing blockchain data at one node is immediately rejected by the consensus), and easily accessible from any network participant. Source: Amy Zhong, Mount Sinai Health System. Several platforms are currently being developed to address optimal interoperability of electronic health records. In August 2016, Ekblaw and coauthors from the MIT Media Lab proposed a novel, blockchain-based medical record management system called MedRec . The system utilizes a system of smart contracts maintained on the Ethereum blockchain to link to an individual patient’s de-identified medical records. Once providers query the blockchain, with explicit permission from the patient, HIPPA compliant data can be unencrypted and accessed from cloud storage, updated, and reincorporated into the blockchain. According to the MedRec whitepaper proposal, “blockchain implementation addresses four major issues: fragmented, slow access to medical data; system interoperability; patient agency; and improved data quality and quantity for medical research.” Several private institutions have begun development and distribution of proprietary blockchain technologies, as outlined in Table 2. Emerging blockchain solutions in healthcare information technology. Platforms may be theoretical, in development, or in current clinical use. Accenture (Dublin, Ireland) Security In partnership with Microsoft, developing blockchain-based identification system based on biometric data. Blockchain Health (San Francisco, USA) Data management Provides HIPAA-compliant blockchain solutions for healthcare organizations; facilitates sharing of data with researchers..
Blockpharma (Paris, France) Supply chain Accesses pharmaceutical company records, allowing transaction auditing. Bloq (Chicago, USA) Data management Offers services for institutions to create, test, and apply custom blockchain soulutions. Bowhead Health (Singapore) Patient-centric care Bowhead device accesses blockchain data to accurately dispense medication and track compliance. Burst IQ (Denver, USA) Data management Manages large HIPAA-compliant data repository; monetizes data sharing. Gem Health (Venice, CA, USA) Data management HIPAA-compliant blockchain platform; allows secure access to sharable data. HealthCombix (Nashville, USA) Patient-centric care, value-based payments Blockchain platform prioritizing patient control of data; token-based payment system. Health Wizz (Falls Church, VA, USA) Patient-centric care Platform allows patients to create a personal health portfolio; smart contracts allow payment for health data in cryptocurrency. iSolve (Sandton, South Africa) Supply chain Organizes, schedules, and tracks delivery of medical devices and pharmaceuticals. MedicalChain (London, England) Interoperability Secure storage of medical data on the blockchain; patients permit access to individual providers/institutions. Patientory (Atlanta, USA) Interoperability Facilitates interoperability of existing electronic medical record systems (ie. Epic, Cerner, Allscripts). PokitDok (San Mateo, CA, USA) Value-based payments, supply chain DokChain, a blockchain-based transaction ledger, focused on financial and supply chain management. ScalaMed (Sydney, Australia Data management Creating a decentralized platform for managing financial and data transactions. Medical record data compatibility has recently been addressed by a proposed standard called Fast Healthcare Interoperability Resources (FHIR), created and maintained by the group Health Level Seven International (HL7) . With the overall goal of facilitating the exchange of medical data across healthcare applications, the FHIR protocol could be utilized as part of a blockchain infrastructure to break down data silos and securely share and distribute medical records. As summarized in a proposal by Peterson and colleagues from the Mayo Clinic, medical documents would not be stored on the blockchain; rather, blockchain transactions may simply allow providers remote access to FHIR data . Several characteristics of a blockchain infrastructure allow for a more secure data maintenance and transfer system, compared to current standards . First, the distributed ledger system fundamentally records an immutable history of transactions. When a patient’s data is accessed, the event is incorporated into the permanent chain, which is then simultaneously updated on all nodes across the network. Any unauthorized record change would not be built into the blockchain, due to lack of consensus amongst network nodes. Second, data within blocks are fundamentally encrypted when added to the chain, such that outside participants are unable to decipher data within. Third, transactions within a blockchain are authorized with a private identification key, known only to the individual. Thus, unlike the EMR technology of today, a medical provider would be able to access a patient’s medical data only with explicit access to the blockchain record. The ability to encode smart contracts within various blockchain infrastructures permits a more efficient value-based healthcare payment model. An insurance payer, for example, may encode reimbursement for a physician to be fulfilled only when certain conditions are met on the blockchain. In this instance, the common mistrust between physician and payer is eliminated. Furthermore, software-encoded reimbursement or financial penalty can be tied to specific health parameters within the blockchain medical record. As such, human error would be removed from enforcing value-based payments, and physicians would be more efficiently held responsible for improving patient care. With a blockchain-based medical record, all prior history, testing, and imaging would be accessible to providers, thus eliminating unnecessary redundancy in the medical workup. Maintaining an immutable identification source using blockchain technology would have significant impact for both patients and practitioners. Similar to traditional identification verification, individuals will be able to have their identities confirmed using a combination of personal, government, and financial records. However, by leveraging blockchain technology, this verification can be stored and utilized in perpetuity. For patients, this can be used when attending appointments or for pharmaceutical pick-up. For physicians, this can be used for licensing and credentialing verification, as well as transfer of license across state lines. With big data, artificial intelligence, and machine learning emerging as revolutionary scientific instruments, a healthcare blockchain infrastructure could permit more effective medical research. With a large, standardized, de-identified data registry, research institutions could perform more significant clinical trials and prospective analyses. Amassing and analyzing information-heavy data sets, such as tumor genomics, would allow for a more personalized medicine. Interconnecting standardized medical data on the blockchain can permit this type of research with a high sample size. Furthermore, reporting of patient safety events and adverse drug reactions would be simplified and more accurately communicated to providers and the general population. Lastly, with the greater use of wearable technology, personal health devices, and the Internet of Things (IoT), the generation of massive, patient-generated data sets can be incorporated into individual medical records, and further analyzed using a blockchain network. As opposed to existing EMR systems in which the medical data are controlled by the clinician, securing medical data on the blockchain allows the patient to become the primary intermediary in distributing his or her medical information . Here, with each new medical encounter, a patient or family member must explicitly permit the provider access to the patient’s medical record, as regulated by the patient’s private key signature. Furthermore, every time a patient’s data is accessed, the event is captured in the blockchain’s immutable transaction history, allowing the patient to know who has accessed and modified his or her record. The current global medical supply chain, consisting of pharmaceuticals, medical devices, and hospital goods, is fractionated and inefficient. Substandard, expired, or counterfeited products directly threaten patient care. A distributed ledger technology permits several advantages over the current supply chain delivery. First, the blockchain maintains an immutable record of available drugs and devices, preventing purchase of expired or counterfeit products. Second, it allows reliable tracking of transactions between hospital and supplier, leading to a greater cost-efficacy and accountability of hospital systems. Lastly, a blockchain infrastructure can be used to facilitate information sharing between healthcare institutions and medical device or pharmaceutical companies, leading to a more effective feedback loop between providers and industry. The foundational benefit of a blockchain infrastructure is its shared, non-modifiable record of transactions. However, the fact that data is shared amongst all participants in a network may seem to undermine the necessary anonymity of protected health information (PHI). This can be addressed by incorporating only de-identified and encrypted data into the blockchain. Whereas information in the blockchain itself is public, PHI stored in data repositories off the blockchain would be heavily protected and HIPPA compliant. Again, accessing this data would only be permissible by the patient, using smart contracts and an anonymous private key to limit access to only specified clinicians. Managing this private key may prove difficult for the individual patient, especially for the elderly or disabled population, but precise biometric linking to one’s key may obviate a physical record. Furthermore, maintaining a confidential private key is no different than protecting a social security number or institutional medical record number for medical data access. The true strength of blockchain technology lies in its ability to confirm with complete certainty that a transaction or an event has taken place, without compromising the specific information of the event. Distributed data sharing requires a network of nodes to build and maintain the blockchain. This poses two problems. First, creating such a healthcare network requires significant buy-in from the medical community. Existing medical systems preserve the status quo, and a novel healthcare infrastructure may prove too expensive or difficult for widespread implementation. Second, maintaining a blockchain network requires significant computing power, which can lead to greater cost of hardware and energy consumption by a hospital system. In both cases, incentivizing participants in the healthcare blockchain may lead to its greater utilization. Blockchain-based applications may distribute tokens to participants in the network, which can be exchanged for services such as increased data storage, faster data transfer, or access to a data repository. Tokens can also be traded for Bitcoin or U.S. dollars on a cryptocurrency exchange, allowing the option for direct financial compensation. Lastly, as it stands now, private medical data is highly protected by both the individual and his or her medical institution. By claiming ownership over a large amount of health records, hospitals and practices monetize data sharing with researchers and industry partners (ex. clinical trials and public health studies). The movement towards decentralized data storage and distribution on a blockchain may encounter significant pushback by institutions that value medical data ownership. Fundamentally shifting the ownership of personal health records to the patient will require a philosophical paradigm shift in both health policy and law. In the coming years, there will be revolutionary advances in the global health IT infrastructure. Emerging technologies will serve to address issues with the current system, including the lack of interoperability of electronic health record (EHR) software, the inefficient and insecure transfer of protected health information (PHI), an ineffective payment system for value-based care, and the evolving need for patient-centered care. Creating and implementing a blockchain-based healthcare network can address these problems in a revolutionary way. As novel technologies are developed, it is up to clinicians to maintain an accepting, yet inquisitive attitude, a willingness to implement new ideas, and a philosophy of feedback rather than absolute dismissal. (CMS) C for M and MS. Electronic Health Records (EHR) Incentive Programs; 2017. Available from: https://www.cms.gov/Regulations-and-Guidance/Legislation/EHRIncentivePrograms/index.html?redirect=/ehrincentiveprograms [Last accessed 2017 Jul 16]. Ekblaw A, Azaria A, Halamka JD and Lippman A. A Case Study for Blockchain in Healthcare: MedRec prototype for electronic health records and medical research data; 2016. Available from: https://www.healthit.gov/sites/default/files/5-56-onc_blockchainchallenge_mitwhitepaper.pdf [Last accessed 2017 Jul 29]. Health Level Seven International. FHIR v3.0.1. 2017. Available from: https://www.hl7.org/fhir/overview.html [Last accessed 2017 Jul 30]. Marshall A. Combined Crypto Market Capitalization Races Past $800 Bln. CoinTelegraph. 2018 Jan 7. [online access at: https://cointelegraph.com/news/combined-crypto-market-capitalization-races-past-800-bln last accessed 2017 Jun 6]. Mell P and Grance T. The NIST Definition of Cloud Computing; 2011. Available from: http://nvlpubs.nist.gov/nistpubs/Legacy/SP/nistspecialpublication800-145.pdf [Last accessed 2017 Jul 16]. Nakamoto S. Bitcoin: A Peer-to-Peer Electronic Cash System; 2009. Available from: www.bitcoin.org [Last accessed 2017 Jul 16]. Patterson, M. Crypto’s 80% Plunge Is Now Worse Than the Dot-Com Crash. Bloomberg; 2018 Sep 12. [online access at: https://www.bloomberg.com/news/articles/2018-09-12/crypto-s-crash-just-surpassed-dot-com-levels-as-losses-reach-80 last accessed 2018 Oct 23]. Peterson K, Deeduvanu R, Kanjamala P, Boles K and Clinic M. A Blockchain-Based Approach to Health Information Exchange Networks; 2017. Available from: https://www.healthit.gov/sites/default/files/12-55-blockchain-based-approach-final.pdf [Last accessed 2017 Jul 30]. The Office of the National Coordinator for Health IT. Connecting Health and Care for the Nation: A Ten Year Vision to Achieve Interoperable Health IT Infrastructure; 2014. Available from: https://www.healthit.gov/sites/default/files/ONC10yearInteroperabilityConceptPaper.pdf [Last accessed 2017 Jul 16]. White House O of the PS. Precision Medicine Initiative. The White House Archives. 2015. Available from: https://obamawhitehouse.archives.gov/precision-medicine [Last accessed 2017 Jul 16].